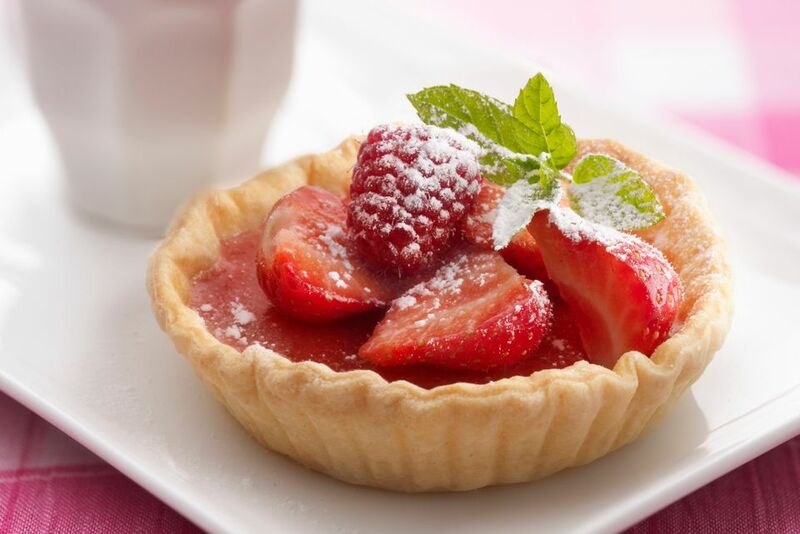 This shortcrust pastry is a light, sweet, crumbly dough used for making tarts and small pies. It's so easy to make: beat the butter and sugar in a stand mixer with the paddle attachment, then add eggs, then the flour. It's exactly like making cookie dough. In fact, the dough itself is basically cookie dough. If you spooned it out onto a cookie sheet and baked it, you'd get shortbread cookies. It helps to keep the butter cool—this prevents the gluten in the flour from developing too quickly, which would produce a chewy, rather than light and crumbly, pastry crust. The consistency you want is almost like a crumbly shortbread cookie. The reason this is called short dough, and indeed, the reason shortening is called shortening, is that fats literally shorten the strands of gluten, so that instead of developing into long elastic chains like in bread dough, they stay short and crumbly. This does make the dough harder to work within because it tends to break apart. This is why it's best for making small tarts (4–5 inches) with. Trying to get it to stretch across a 9" or 11" tart pan without breaking into multiple pieces, and then trying to mend those pieces together, will be an exercise in frustration, if not outright futility. You can also use this shortcrust dough for making savory tarts—just omit the sugar. And remember, don't overmix the dough or mix it at too high of a speed. Doing so will overwork the glutens. Instead of light and crumbly, you'll get something closer to pizza crust. You could substitute vegetable shortening or lard for half the butter, as long as the total adds up to 250 grams. Butter is much more flavorful than shortening. Note that you need to chill the dough for a few hours to allow the glutens to relax. If you're in a rush, you could probably get away with chilling for an hour. But no matter what, make sure to let the dough come back to room temperature before you try rolling it out, or it will for sure break apart. You'll need to use flour to keep the dough from sticking to your rolling pin, but use the least amount of flour you can get away with. The more flour there is, the heavier your dough will be. For precision, the ingredient amounts below are given in weights rather than volumes. So you'll need a digital scale that can be set to grams. Using the paddle attachment of a stand mixer at a low speed, combine the butter, sugar, and salt until they're fully mixed. Add the eggs and keep mixing until they're incorporated. Add the flour. You're only going to mix until the flour is fully incorporated and not a second longer. Chill the dough for 3 to 4 hours before using.